Some guys went to a particular food joint in an old city locality and came back crying--we didn't know they could serve us Jhatka chicken? Now what you can say about that! The fools went and eat without asking and imagining that all across India every one would serve halaal. In Delhi Muslims are over 12% but no shop or hotel has put up the halaal/jhatka on the menu or food items while the 1% Jains have managed to get Jain Pizza [without onions[ and all non-veg items clearly marked. Why? I am not prepared to believe that despite their economic backwardness the lakhs of Muslim consumers can't affect the business. They can surely do. But they neither ask the hotel owner about the issue jhatka/halaal or register their protest if he sells jhatka. The guys did not have the nerve to object it to the hotel owner in an area and tell him that he should display it. We are just not articulate enough, least aware of consumers' rights and even careless about the jhatka/halaal issue because just when you see the chicken 'aapkem munh mein paani aa jata hai'...and you hope...chicken halal hi hoga. But they did not dare do that. If you are such a fool why don't you quit eating chicken outside altogether because no one is sure about the small chicken whose neck can be twisted easily anywhere without the need of any butcher. Interestingly, once in a big hotel I saw a youth wearing the skullcap and making kebabs. I asked the Muslim guy if it was halal. He said he was not aware of that. I asked him why the hell was he wearing the 'topi' that would have confused many and he just grinned sheepishly. Frankly I damn care. If you are really a glutton and want to eat jhatka, go and do that but this 'beech mein latakne wali baat' I hate it. But what angers me is that guys pretend to be too particular about Islam but at the same time are not interested in asking if the Sardarji's hotel sells halal. 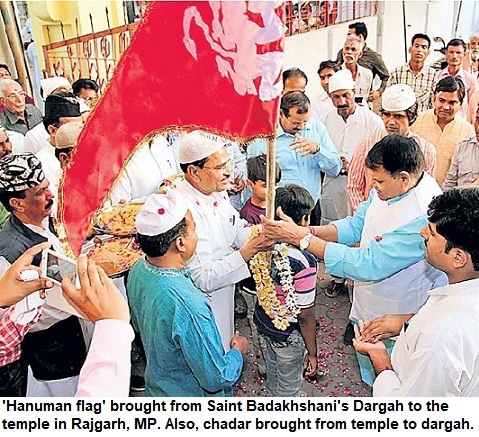 Why is Raj Thackeray wooing Muslims, Dalits & other minorities? 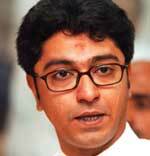 Bal Thackeray's nephew Raj Thackeray is courting Muslims and the Dalits too. This comes as no surprise and Raj understands ground realities. Mumbai is a cosmopolitan city, the most diverse of all metros and has a staggering Muslim population now. In the census of 1991, Mumbai metro had a population of 17 lakh Muslims that went up to 23 lakh in the Indian census of 2001. Who can ignore Muslims! The city has 4% Christians (the highest of any other metro) and a large number of Dalits/neo-Buddhists. Further, Maharashtra is the only state apart from the small North Eastern states where there is such a large Buddhist population. In fact, the Buddhist population of Maharashtra alone accounts for over 75% of all Buddhists in India. Almost 75 lakh Buddhists live in the state. It is for this reason that Shiv Sena/BJP find it hard to get a majority in a state that has the headquarter of RSS. Basically the Shiv Sena and BJP start with a disadvantage of almost 20% votes (Muslims-11% in state and Buddhists-8% in state). The Sena has antagonised the North Indians, South Indians, Muslims, Christians, Buddhists, Dalits. So who will remain with them? Raj understands this ground arithmatic and that is the reason why the new found love towards Muslims. Surely, Uddhav will find it difficult to prove himself as the real successor to Thackeray. One of my friends who is a committed Jan Sanghi*, recently said in an argument that Muhammad Rafi was a man he always idolised despite his own distaste towards Muslims in his teenage years. 'I don't think any other Muslim has been loved, admired and heard so much in this country', he said and I couldn't agree more. Among umpteen Indian Muslim role models, Rafi's stardom is unique. When we talk about Muslims who were and are role models, we hardly remember Rafi these days. The most popular playback singer ever, Rafi's melodious voice has enchanted, enamoured countless Indians. 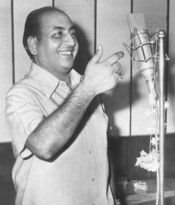 Rafi sahab lifted the moods of millions everday for the last five decades. From 1946 to 1980 Rafi Sahab reigned over the Bombay film industry. Across the vast landscape of this country, wherever you go you will surely hear Rafi's voice from radios at the streetside shops and homes. It is generally believed that there can never be a second Rafi. A great singer and a great human being, Rafi Sahab helped innumerable needy persons. There used to be a queue outside his house and he handed over the envelopes containing Rs 100 or Rs 200 without asking anybody's name. Quite a lot of hue and cry was raised over the proposal for a so-called 'census' of Muslims in Indian Army. After the Sachar panel had hinted that the number of Muslims in the armed forces could be sought, there was opposition from several sections against the proposed headcount on basis of religion. There is no official report. However, the strength of Muslims is roughly around 3 % and the figure comes around 29,000 in the million-strong Indian army, according to news channel CNN IBN's programme titled Minority Report. If the number of Muslims serving in Jammu and Kashmir [J&K] infantry that has over 50% Muslims and those in other wings not directly dealing with warfare are excluded, the proportion is definitely too low. So out of a Muslim population of nearly 150 million [15 crore] in India, barely 29,000 Muslims were found suitable for recruitment in the Indian Army. There has been a lot of controversy but these figures neither surprise nor sadden me. The fact remains that if competent, a Muslim can rise in India to the highest position in any services including army, and has more chances than any other country. This is my belief despite all the charges of discrimination, communal riots and experiences of bias. There are Muslim officers serving in Indian army at senior levels. Idris Hassan Latif, more commonly known as IH Latif, rose to the position of Air Chief Marshal. 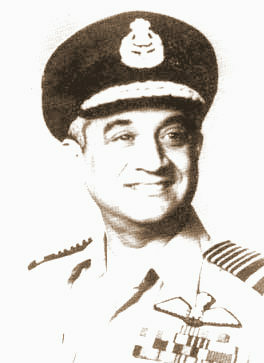 Latif, who later served as Governor of Maharashtra and Ambassador to France, was head of Indian Air Force from 1978 to 1981. The role and bravery of Muslim officers and army in fauj has been second to none. Brigadier Usman gave his life fighting in Kashmir and it was the effort at Uri, that the invaders couldn't get advantage in the turbulent period, soon after partition. The gallantry of Havildar Abdul Hamid is known to all and sundry. His valour in the Khemkaran sector during 1965 war is now part of Indian army's folklore. 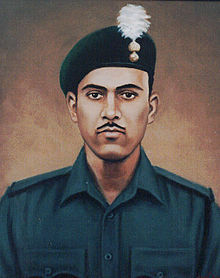 Hamid was posthumously given the highest gallantry award--the Paramvir Chakra. In the Kargil war, Captain Hanifuddin was amongst the first of officials to lay their lives for the motherland. The legacy of these war heroes--their bravery and sacrifice for the nation, must be carried forward. Muslims surely need to be given more opportunities during the army induction exams and the recruitment drives. It should not be limited to political speeches eulogising Muslim jawans' service for the country. In communal riots, army has always been welcomed by Hindus and Muslims alike, as the local police force is often charged of communal biases. But army's neutrality remains undisputed. Lately there have been efforts to increase the strength of Muslims and other minorities in army, paramilitary forces and police. Perhaps, there is need for specials camps and recruitment drives in different regions of the country, for Muslims, so that they can also get a fair chance for entry into the army and it serve it. These steps will hopefully change the situation. Rashtriya Sahara Urdu daily has announced that it plans to launch new edition from Mumbai. The paper will appear on stands on April 1. This is a wonderful news as it has been a long time since Mumbai or any other metro saw the launch of a standard Urdu paper. After Blitz weekly ceased its publication, no major newspaper was launched from Mumbai where a sizeable Urdu readership exists. With Urdu Times and Inquilab doing well, the third newspaper will help expand readership. It also proves that Urdu is alive and kicking. What we need is just to subscribe to at least one daily, a weekly and a periodical. Every Urdu-speaker should do this. Balraj Komal is a noted Urdu poet, who is based in Delhi. Komal, who was born in Sialkot in today's Pakistan, had migrated to India, after partition. He is considered a poet of modernist [jadid] stream. Two firsts and both of them are really unfortunate. Lucknow opened its account as far as Hindu-Muslim riots is concerned, as it never had a history of such clash and so did Goa. In Lucknow the rivlarly was between Shias and Sunnis, so the news of Hindu-Muslim clash that was sparked off during the Bush's visit to India ws received with shock. Lucknow was the City where Hindus and Muslims for centuries shared the same culture and were proud of this ganga-jumni tehzib. It is an unfortunate incident and could have been avoided. But politics, an ineffective government, failure of local administration and the delayed response of police. The law-enforcers claim they were busy due to the visit of President APJ Abdul Kalam to Lucknow on the same day and hence situation got out of hands. As far as Goa is concerned, the Hindu-Christian tension has existed but now the Hindu-Muslim riot came as a surprise. A mosque was demolished in Sanvoderm [South Goa district]. The administration felt it was an encroachment. But some residents, rather than district administration, demolished the mosque which naturally led to tension. The tension spread to neighbouring Curchorem. Shops and vehicles were burnt in the subsequent violence. So the communal bug has bit Goa also. Long back the famous English daily Pioneer had started losing its credibility. I have absolutely no problem with the fact that it has stolen a march over Organiser and Panchjanya in anti-Muslim rhetoric. But the poor quality of paper on Thursday was nauseating. On page 1 it said that the 'Muslim fundamentalists' held protest against Bush. The call was given by over two dozen organisations including communists, Samajwadi Party, RLD and many other organisations. Even this can be tolerated to an extent. But the wrong reporting and blatantly biased story under the headline 'Islamist wrath snarls up traffic' hit an all time low. "The Jamat participants at the rally, who were joined by the Marxist groups especially some teachers from Delhi University and Jamia Milia Islamia, equated President Bush to a dog, the mythological enemy of Prophet Mohammed." , this was what the story reported. This absolutely absurd story reflects the absolute mental bankruptcy of the paper. Really the staff has gone mad. What mythology? Who would not feel enraged! Jab aise jaise bewaqoof akhbaar chhap rahe hon to kya kaha jaye. Once it was a highly respected paper. Now it has sunk below even the papers that are mouthpieces of organisations and propagate their ideology. Alas this paper had a tradition of 125 years until it came to Chandan Mitra who apparently sought financial support from BJP to run it. But far from running a healthy right wing paper, it has plummeted to such cheap stories. Shouldn't there be any sense of propriety and objectivity? When you have a newspaper in your hands, you must feel more responsible too. Unfortunately, 'The Pioneer' is harming its and its supporters too with such form of reporting and journalism, which even the rabid right-wing tabloids don't do as frequently. For a newspaper with a history of over 125 years, it is really a sad chapter, especially, in the 21st century.